Slatted cedar privacy fencing combined with a drought-tolerant + low-maintenance perennial garden creates a private, relaxing backyard landscape. A cobble-lined gravel pathway meanders through a hillside woodland perennial garden, bordered by horizontal-slatted cedar privacy fencing. Timber + gravel stairs connect gravel pathways and outdoor living spaces in this hillside backyard landscape. Timber + gravel stairs are bordered by pollinator-attracting perennials like this drought-tolerant Jupiter's Beard [Centranthus ruber]. Cobble-lined gravel pathways + timber steps lead downwards through a woodland perennial garden beneath a canopy of Oak trees. A lush perennial garden provides a bee-friendly + colorful landscape. This natural gas stone fireplace and gravel seating area provide a perfect spot for enjoying a late summer evening. Large granite boulders create a rustic, natural gas fire pit in a woodland backyard setting. 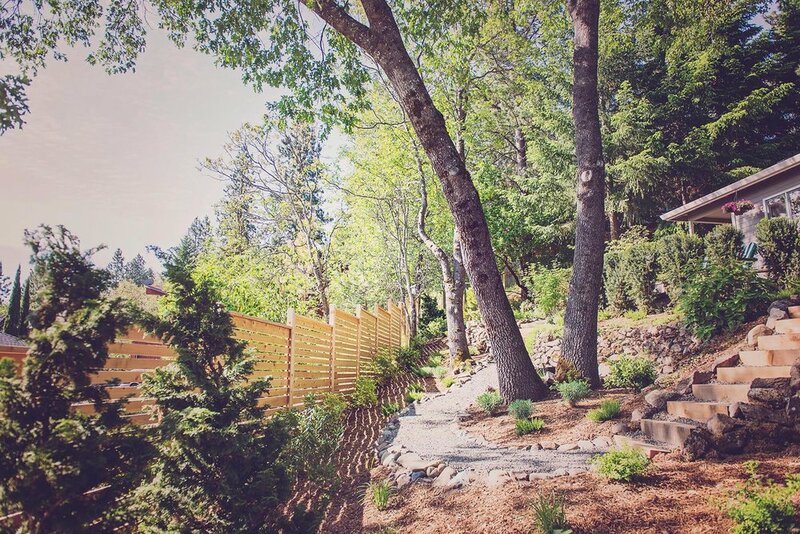 Slatted horizontal privacy fencing provides a more private backyard landscape. Rhododendrons bloom in the foreground against a horizontal cedar slatted fence. Cedar privacy screening and native shrubs form the border of a private backyard landscape. 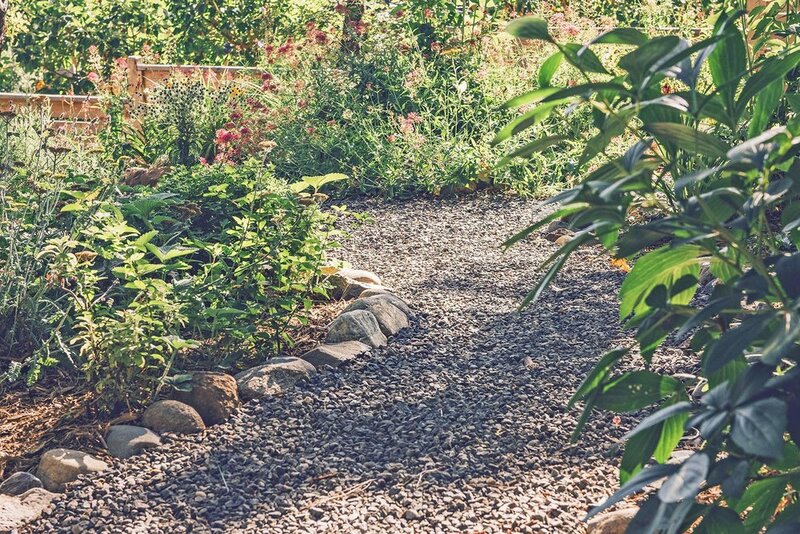 Cobble-lined gravel paths with timber stairs meander through a drought-tolerant + low-maintenance perennial garden of Jupiter's Beard, Yarrow, Heather, and Lavender. A rustic natural gas fire-pit combines with granite boulder seating and woodland plantings to a create a quiet relaxation space beneath the stately Oak trees.